Which QB would you go to war with? Mr. Holland had “An American Symphony.” I have Simbotics. That’s nine of the first 32 games: All lay-ups if you had those teams figured out before Vegas. Even if you finished one game over .500 on the other 23 games, adding your 9-0 for the other ones, that’s 21-11 through two weeks. Do your homework, stick to your guns and good things will happen in September. Of course, that doesn’t mean we should stop tinkering with the system. I added two wrinkles for my 2010 preparation. Every season from 2003-09 had at least one “sleeper” (a playoff team that finished 5-11 or worse the previous season), one “creeper” (a non-playoff team that jumped at least five wins and earned a first-round playoff bye), and one “grenade” (a No. 1 or No. 2 seed that missed the playoffs the following year). So figure out which three teams will fit those categories. Every season since 2003 (one year after the NFL switched to eight divisions), we’ve seen at least three non-playoff teams from the previous season make the playoffs with a plus-5 (or better) increase in wins, and we’ve seen at least three playoff teams drop out with a minus-4 decrease (or worse) in wins. These were mostly sleepers, creepers or grenades. Check it out. Final tally: seven seasons, 11 grenades, 10 creepers, eight sleepers. That’s the National Football League for you. Teams go up, teams go down, parity prevails. That’s what the league wants. but now they’re saddled with a tougher schedule, higher expectations, bad memories from January, Brett Favre limping around on a bad peg, Sidney Rice missing for two months, Percy Harvin crippled by migraines, a possible juggernaut lurking in their own division (Green Bay), Brad Childress, Brad Childress and — for a third time — Brad Childress. Feels like a grenade-eligible 7-9 or 6-10.
Who gets those four 2010 playoff byes? I’m writing in Indy and Green Bay with a permanent pen. I’m using a pencil for the Steelers, who suffered a textbook Super Bowl hangover season, then threw everyone off their 2010 scent with Ben Roethlisberger’s suspension. Even if they go 2-2 without Not-So-Big-Anymore Ben and 9-3 with him, that’s a 2-seed unless Roger Goodell rules that Roethlisberger has to play every game while wearing a black ski mask and O.J.’s old Isotoners. Don’t rule this out. For our fourth playoff bye, house rules require a 2010 creeper. I thought about the Titans (8-8 last season, frisky down the stretch), but that means going against division rival Indy. The Colts are like a cold craps table — once you realize it’s cold, just walk away. Don’t try to be a hero. It will end badly. Always. Same for going against the Colts. Don’t be a hero. Let them tell us when they’re done. Then, and only then, can you start picking against them. Another team with creeper potential: Atlanta. 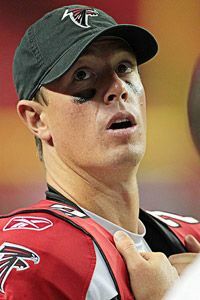 I see the Falcons flipping places with New Orleans thanks to a killer 2008 draft (in Season 3, the benefits are reaped); some bad 2009 luck (usually evens out); comeback years for Matt Ryan (battled turf toe, didn’t have slot guy Harry Douglas last season) and Michael Turner (banged up last year); an upgraded defense (headed by free agent Dunta Robinson); a quality coach (Mike Smith); a genuine home-field advantage (the Georgia Dome); and a mildly weird streak tilting in their favor (no team has won the NFC South two years in a row). Unfortunately, creeper laws say we need a plus-5 increase and the Falcons went 9-7 last year. Did you know no NFC team has won 14 games since the 2001 Rams? Sorry, Atlanta. I still have you going 11-5. That leaves San Francisco: Dreadful division. Four games against the AFC West. A creampuff home schedule (toughest game: New Orleans in Week 2) and five potentially tough road games: Atlanta (Week 4), Carolina (Week 7), Arizona (Week 12, Monday night) and San Diego (Week 15, Thursday night). If Zona craps the bed with Derek Anderson — and he’s a serial bed-crapper — then why couldn’t the loaded Niners improve from eight wins to 13? What do those seven quarterbacks have in common? They all went 13-3. So there. As for my other postseason picks, the Three Up/Three Down Corollary requires two more newbies with five-win jumps (I’m picking the Giants and my 2010 sleeper, to be revealed shortly), as well as two ’09 playoff teams falling out with a four-win drop (that’s easy: Philly and Arizona). Filling out the postseason spots: two newbies (Atlanta and Miami) and two incumbents (Cincy and New England). That gives us six newbies and six incumbents. Perfect. Blowing through the other 20 teams: I have the over-over-over-overhyped Ravens (just as shaky a defense as New England, not as good an offense), Cowboys (we’ll tackle them later) and Texans (the NFL’s Tom Cavanagh in that everyone likes them, but they can’t seem to find a hit show) as overvalued; the Panthers, Lions and Raiders as undervalued; the Rams, Bills, Broncos, Seahawks, Bucs and Bears as the league’s doormats; and the Jags, Titans, Chiefs and Browns treading water. So I’m wagering accordingly. That brings us to my 2010 sleeper. You know the drill. Has to be a team that sucked the previous year (6-10 or worse). Has to be a team getting little to no buzz. Has to be someone with a fairly easy September schedule that you could see making the cover of Sports Illustrated before Week 4 or Week 5 with a headline like “Here Come The Raiders!” Has to be a team that can realistically jump five wins or more. Has to be a team with something of a “new-car smell” — either a newish coach, a newish QB or both. And ideally, it should be a team that makes people say, “Wait a second — really, you’re picking THEM?? ?” Although you can’t force it. If it’s not there, it’s not there. Only Buffalo, Kansas City, Tampa, Seattle, St. Louis, Washington, Cleveland, Detroit and Oakland qualify for “sleeper” status in 2010. We’re throwing out the first five on principle. The Browns finished 2009 strong and reek of sleeper potential, but we’re eliminating them because God hates Cleveland. The Raiders look enticing because of their division (awful), schedule (only three ’09 playoff teams), QB (even if Jason Campbell is mediocre, that’s a huge leap for them), talent (decent) and “Really!” factor (pick the Raiders for the playoffs and anyone with an IQ over 75 goes, “REALLY???????”). Then you remember that Al Davis is a decomposing Donald Sterling. Scratch them off. And Detroit’s youthful friskiness and the Ndamukong Suh/Jahvid Best/Kyle Vanden Bosch additions are appealing, but only one team finished 2-14 or worse and made the playoffs this decade: the 2008 Dolphins. Too risky. The Lions are a year away. That leaves the Redskins of Washington. Four wins last season. Slipping under the radar in 2010 because of their division (tough on paper), this summer’s insufferable Mike Shanahan/Albert Haynesworth feud (overshadowed all other Redskins news), high turnover (they cut 10 veterans and signed 27 new free agents) and last year’s embarrassing 0-6 record in the NFC East. But as Football Outsiders points out, the ’09 Redskins were significantly unlucky in two departments: injuries and close games (2-7 in games decided by a touchdown or less). Throw in the Shanahan/Jim Zorn and Donovan McNabb/Jason Campbell upgrades and that’s my choice.